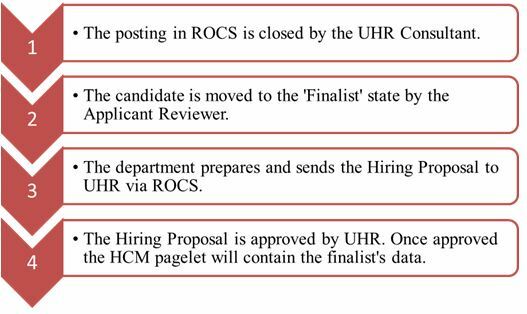 Beginning Wednesday, March 16, ROCS will automatically populate certain fields in the HCM New Hire Template when a ROCS Hiring Proposal is approved. The tool will be used for all PeopleSoft ‘New Hires’, however this tool will not be used for Banner Hires, or Internal Hires. If you have any questions please reach out to the ROCS Administrators at 848-932-4444. This tool will take specific data fields from ROCS and auto-populate the HCM New Hire Template for Class 1 Staff PeopleSoft positions. This will occur when a Hiring Proposal is approved in ROCS by a UHR Consultant. This new feature will reduce errors when preparing a new hire template, and will also decrease the time spent inputting data. The HCM Preparers will now have a pagelet on their home screen that will contain the name of a candidate who was approved in ROCS. The name in the pagelet represents that their data is ready to be imported into a New Hire HCM Template. Please note: When a Hiring Proposal is approved the data will be fed into HCM on the following day. This new tool will also incorporate a change to the navigation link in HCM. A preparer will be able to navigate to the new area simply by following the navigation commands. Please see below for a step-by-step guide on how to utilize the new tool. Page last updated by University Human Resources at 9:48 pm January 9, 2017. This page was printed from rocs.rutgers.edu/index.php/2016/03/14/update-rocs-feed-of-class-1-staff-data-to-hcm-peoplesoft/ on Friday, April 26, 2019.